Moving supplies have been dominating my thoughts of late and taking over my apartment too. With boxes stacked everywhere the walls are, quite literally, closing in. When claustrophobic thoughts threatened this afternoon, I took a deep breath and remembered that wide, open spaces were waiting outside. But a funny thing happened when I walked through my front door into a bigger world. I promptly fell into a smaller one. I was sitting beneath a favorite shade tree, just letting my mind wander anywhere it wanted to go that didn’t involve packing, when my adventure began. Staring absently at the clover 6’ beyond my feet and growing sleepy, I wasn’t even startled when a pointy, soil-dusted nose suddenly pushed it’s way, dreamlike, to the surface. 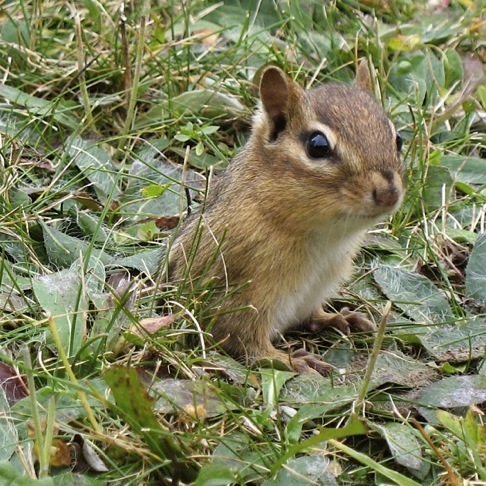 In short order the nose became an Eastern chipmunk (Tamias striatus), complete with rusty-brown face, two bright, black eyes, curious, mobile ears, small hands, and a slender torso. Of course, vertical stripes are always slimming. Maybe I was large and still enough to be perceived as part of the tree. Perhaps a long to-do list was urging her on to the tune of “I’m late, I’m late, for a very important date!” Either way, that rodent paid no attention to me at all as she immediately set to work. I settled in to watch, sure I’d found the perfect distraction from my own busy schedule… but then she started packing. No, she didn’t pull cardboard boxes and rolls of tape out of that hole in the ground. No need, when you’ve got a steamer trunk in each cheek. Okay, technically they’re pouches, but they are used to transport things from one place to another. Lots of things—this species has fewer molars than other chippies so there’s extra room. What do chipmunks need to carry? Some plant-based bedding now and then, but mostly groceries. During the summer their diet includes perishables such as wild fruits, bird eggs, insects, and other small creatures. These items are consumed immediately. Nuts and seeds are naturally long lasting, so they end up in underground caches. When you need both your arms and legs to get around, there aren’t any limbs left for lugging things to and fro. Ergo… you stuff your face. 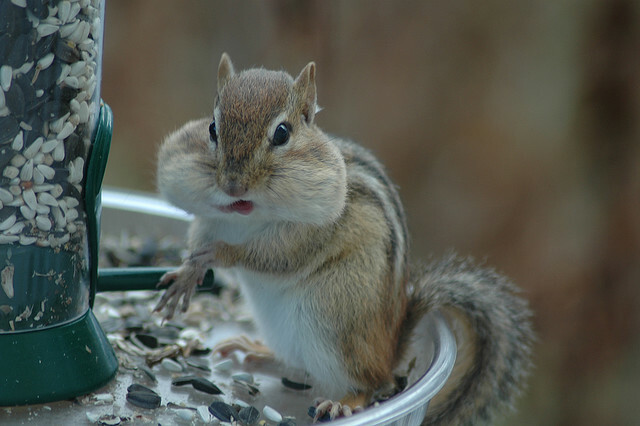 When the cheeks are full, they may double the size of the chipmunk’s head. Think Dizzy Gillespie. Believe it or not, there are people who spend time documenting and reporting what chipmunks pack into these pouches, and we’re not talking small potatoes. Seriously—the pouches are big, but they’re not that big; an adult chipmunk is smaller than your average restaurant Idaho. The cheeks are large enough, however, to hold 70 black-oil sunflower seeds, 31 dried corn kernels, or 13 prune pits (where do chipmunks find prune pits I wonder… curiouser and curiouser). As the small face in front of me grew wider, I began to doubt that it would fit back through a 2” opening without leaving behind some of the payload. I forgot that by this time of year, even a young’un would be an old hand at this. She dove into the entrance without a second’s hesitation… and me right on her heels, having conveniently shrunk down to chipmunk size (in my mind, that is—there weren’t any bottles labeled “Drink Me” at hand). I’m not Alice and this was no rabbit hole, so we didn’t fall into a chasm. The whole burrow was only 18-36″ below the surface. She scampered along an 8’ tunnel towards a labyrinth of chambers and passageways, darting past what appeared to be a nesting area into the pantry; one of many pantries, actually, although technically, I think these rooms are referred to as hoards. From November through March or April, chippie chick and her kin will spend most of their time underground. If the weather above is warm enough, they’ll venture out to forage, especially if there’s a handy bird feeder nearby, but chipmunks rely primarily on foods put up during the summer months. Not a true hibernator, they arouse now and then from periods of torpor. When they do they need to eat, and there’s no cake in this Wonderland. Or books, or dishes, or clothing, or any of the other myriad items waiting to be stuffed into the cartons I’m using instead of pouches. But my belongings won’t pack themselves and my new friend is busy taking care of her own business. “Time to leave Wonderland,” I thought, shifting ever so subtly. And with that, I was instantly transported back to my favorite tree, watching a tail tip disappear into a hole in the ground. Definitely time to return to the land of boxes and rental trucks… and cake! When I head out for more supplies I think I’ll stop at the grocery store for a treat. This is one cake that doesn’t need to say “Eat Me.” With all the bending and lifting and stair climbing I’ve done today, I can have a slice without fear of growing too large to fit in my apartment. © 2011 Next-Door Nature— no reprints without written permission from the author. Thanks to Doug Cadmus for making his photo of a chipmunk feasting at a bird feeder available through a Creative Commons license. This entry was posted in behavior, clues and signs, Eastern chipmunk, feeding behavior, mammals, natural history and tagged burrows, chipmunks, Eastern chipmunk, feeding behavior, hibernation, hidden nature, hidden wildlife, mammals, Nature, postaweek2011, surburan wildlife, urban wildlife, watchable wildlife, wildlife by Kieran Lindsey. Bookmark the permalink.